Where a patient walks in and wishes to make an account payment, open their account details. Click the Account button in the top toolbar. Then search for the patient or company. The simplest way to process a payment is using the Point of Sale Screen. Payments will automatically go towards the most recent invoice. However, if you would like to allocate the payment to a particular invoice item, open the Account Payment tab. Enter the payment amounts into the appropriate boxes (Cash, EFTPOS, Cheque, Card or Direct debits) and press [Enter]. The payments will then appear in the payments list. In the top list, select the payment you wish to allocate. In the lower list, double-click on an invoice to allocate the payment to it. If an invoice exceeds the payment amount, the invoice will be partly paid. The amount still due will be displayed in red, under “balance”. 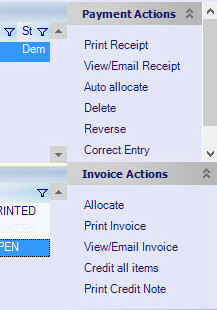 Click Auto-allocate to allocate payments against the oldest outstanding invoices. Click Print Receipt to print today’s payments. Click View/Email Receipt to save today’s payments as a PDF and/or email the receipt.